Thanks for a great holiday season! We will NOT be monitoring Facebook, emails, or ticket requests while we are closed so that we may concentrate on making items for the upcoming season. Please visit this website again in early June 2019 to find out when we will reopen (sometime mid to late June) and when we will begin processing tickets for the upcoming season. Tickets are required anytime the shop is open and are limited based on what we are able to produce. Can’t wait to see you next summer! Happy New Year! Take time to relax, breathe, and stop and count your blessings! Please refer to the FAQ section on the web-site. 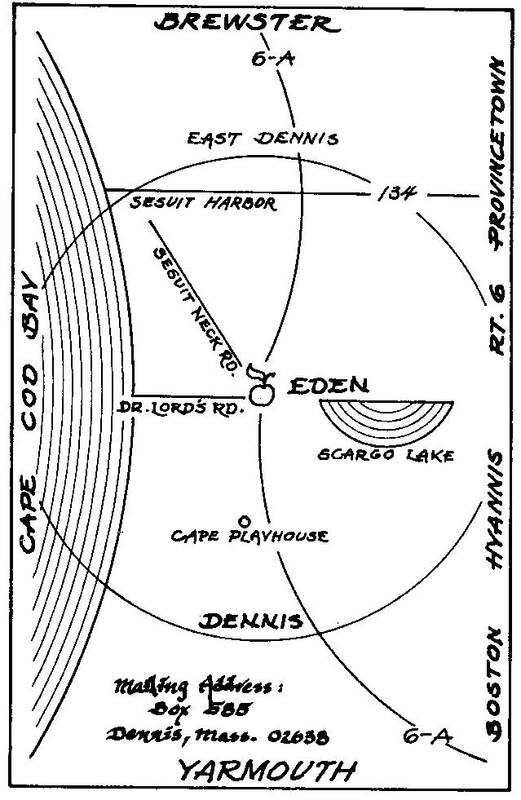 Eden is located at the corner of Doctor Lords Rd. (number 2), US Route 6A and Sesuit Neck Road, approximately one mile west of Route 134 and one mile east of the Dennis Playhouse. PLEASE NOTE: We do no business of any kind through the mail—including email, the web or over the phone—no repairs, NO TAGS, no exceptions. We do stand behind what we sell 100% but the item or return must be brought to us when we are open. There is a small parking area in front, another behind our sign and a third off Dr. Lords Road. Please park in designated spaces. Do not park on any streets as you will get fined. Please respect our neighbors and do not turn around in their driveways. We ONLY accept cash or checks. We do not accept credit or debit cards. If you want just one thing (not including tags) and you know what specific item you want, you can come to the side door without a ticket. We can measure for the right size fit for your bracelet. What we can’t do is bring a variety of different type bracelets out for you to decide. For that you need to come into the shop with a ticket.